A socially polite garlic that does not leave a strong odour on your breath. The leaves and flowers of Society Garlic plant, Tulbaghia violacea, can be chopped into salads, savoury and meat dishes. Useful as a garnish and delicious on bread with butter and vegemite. An attractive edging plant. 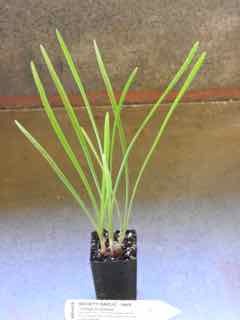 Society Garlic plant is a native of South Africa and prefers light to medium, well drained and moist soils. Plant in a protected, sunny position. Mauve, trumpet shaped flowers occurring in terminal heads during spring. A perennial plant, growing to 0.45m x 0.3m. Be the first to review “Garlic, Society plant” Click here to cancel reply.